What's the easiest, most secure and most convenient way to give a trusted visitor access to your home? Clue: it's not a key hidden under a rock. The answer is a unique user code. It's a four-digit access code for your Alarm.com security system and smart lock. It's easy to create (and delete), you can restrict it to certain days and times, and you can have Alarm.com alert you whenever your visitor uses it. Here's how to set one up. Log into Alarm.com on your desktop or laptop and click the Users link under the Security tab. In the 'Add User' screen, give your user a name, and specify their access level. You'll want to click the 'Panel Access' icon to let them disarm your system. If you have smart locks, specify which lock(s) they can use. For the dog walker, we're selecting the front door only. Enter a unique code for your user. This code enables them to disarm your security system and open your door's smart lock. 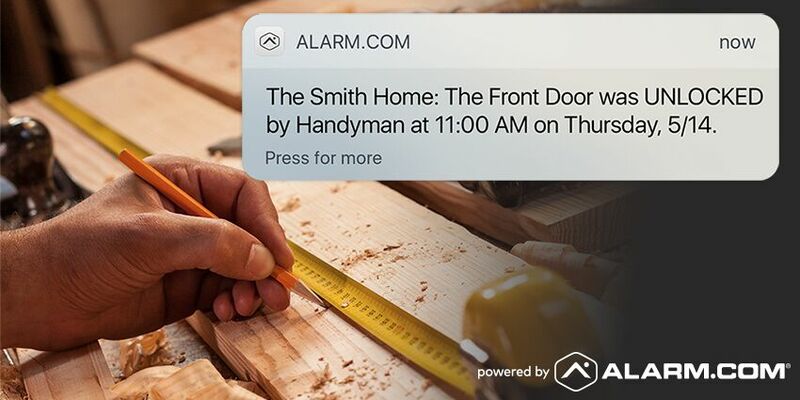 Because the code is unique (you can't duplicate your user codes), it also enables Alarm.com to identify who accesses your home, and send you an alert when they enter or leave. Now, specify your user's access time. You can choose 'At All Times', or you can specify certain time windows only. For our dog walker, we're specifying weekday access between 11am and 2pm. Click 'Save' and your new user is created! You can now create an optional alert that lets you know when they arrive and leave. For a quick introduction to creating notifications, click here. If you no longer need to give the user access, the code is easy to delete. Navigate to the Users screen again and find the user code. Then, click the 'trash' icon (circled below) and confirm the deletion. To change a user's access details without deleting them altogether, click the 'edit' icon, which will take you to an 'Update User' screen where you can change their permissions, times and four-digit code. Now that you've created your first user code, you can create one anytime you need to let a trusted guest into your home. For more Alarm.com smart home security tutorials, click here.